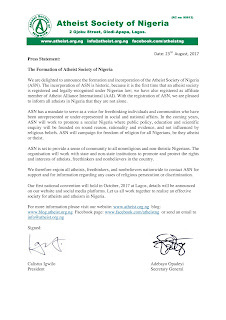 Atheist Society of Nigeria (ASN) was officially incorporated on the 10th of March, 2017 with the Corporate Affairs Commission (CAC) of Nigeria and has it's RC No as CAC/IT/NO 95613. It has also registered as an affiliate member of Atheist Alliance International, with a membership certificate issued on 22nd of August, 2017. ASN presently consists of 9 members of the board of trustees drawn from various regions of Nigeria and has a 5 man executive committee with Calistus Igwilo as the President. 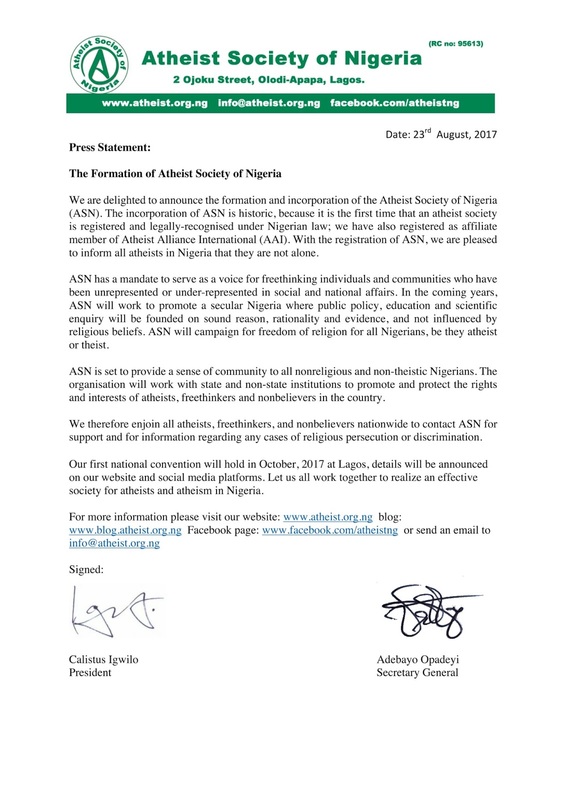 The incorporation of ASN is historic, because it is the first time that an atheist society is registered and legally-recognised under Nigerian law. With the registration of ASN, we are pleased to inform all atheists in Nigeria that they are not alone. In the coming years, ASN will work to promote a secular Nigeria where public policy, education and scientific enquiry will be founded on sound reason, rationality and evidence, and not influenced by religious beliefs. ASN will campaign for freedom of religion for all Nigerians, be they atheist or theist. ASN is set to provide a sense of community to all nonreligious and non-theistic Nigerians. The organisation will work with state and non-state institutions to promote and protect the rights and interests of atheists, freethinkers and nonbelievers in the country. We therefore enjoin all atheists, freethinkers, and nonbelievers nationwide to contact ASN for support and for information regarding any cases of religious persecution or discrimination. Our first national convention will hold in October, 2017 at Lagos, details will be announced on our website and social media platforms. Let us all work together to realize an effective society for atheists and atheism in Nigeria. Whoa, this is a new beginning, nice one.